One of our first experiments was the "dancing cockroach leg" in which nerves and muscles of a cockroach leg could be electrically excited by the output of an mp3 player. But let's go further back. Way back. To 1780. To Northern Italy. In this lab you will recreate the famous experiments of Galvani and Volta. You will build a replica of the very first battery, invented by Volta and which began the electronics revolution that continues today, and you will use it to to stimulate the nerves of a cockroach leg, in an adaptation of Luigi Galvani's famous frog leg experiments that began the NeuroRevolution still manifesting. You are starting from zero. You are beginning the field of neuroscience. There are no previous experiments to do. In our previous microsimulation experiment we plugged the audio cable of an mp3 player directly into pins inserted into a cockroach leg. The electrical waves of the music then excited the nerves and muscles of the leg, causing the leg to appear to "dance" to the low frequencies (the beat) of pop music. This worked because an mp3 player is capable at max volume of sending out oscillating voltage signals at 1.3 V, which is sufficient to excite nerves and muscle at the music frequencies below 200 Hz (the bass). This was a modern interpretation of Luigi Galvani's famous frog leg experiments, but we have now found the experiment can be made more educationally and emotionally compelling by building our own voltage source (battery) out of common materials - a potato, a sheet of aluminum, and a sheet of copper. 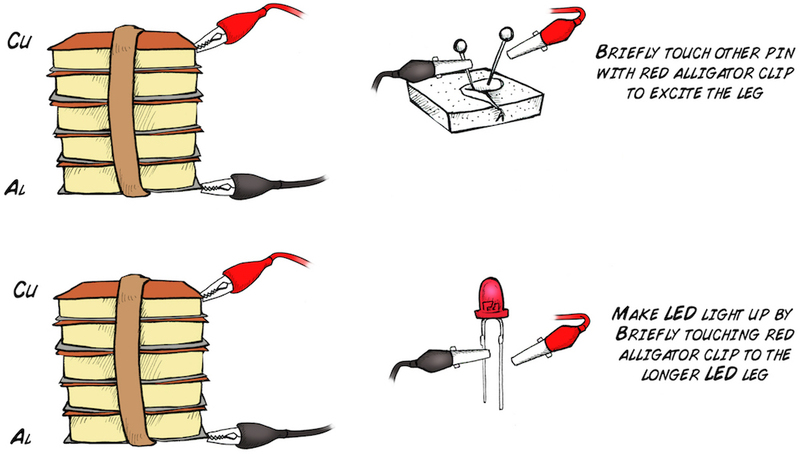 In this variation, we are building a replica of Volta's "Voltaic Pile" and using it to stimulate the cockroach leg, as a replica of the famous debate between the two scientists. Our differences are minor: 1) We won't need to sacrifice frogs like Galvani did. 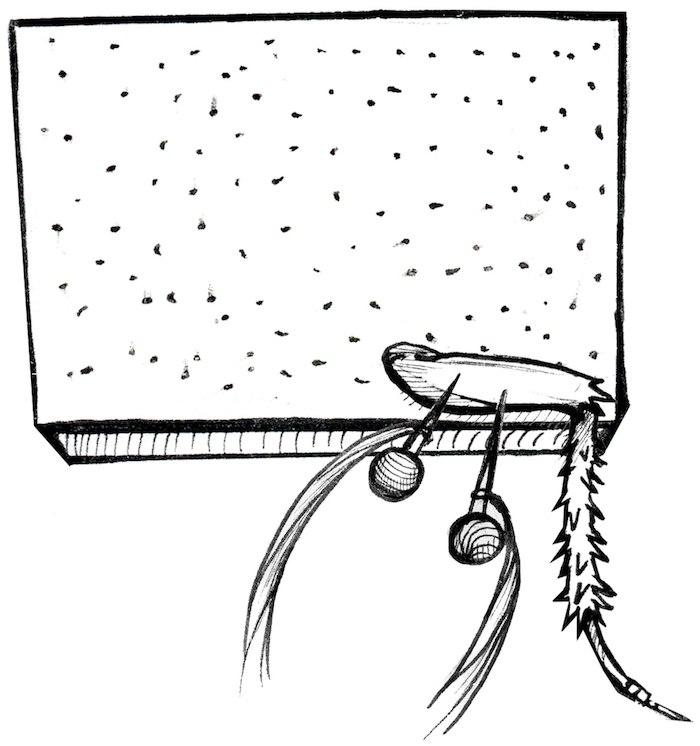 Rather, we will remove a hind leg from a cockroach, which the cockroach can easily tolerate, continue walking, eating, being a cockroach, and, moreover, will regrow a new hind leg within 125 days, and 2) Volta's "Pile" used alternating layers of copper and zinc separated by cardboard soaked with salty water. We will use alternating layers of copper and aluminum, as aluminum sheeting is easier to find in art/hardware supply stores. Also, using cardboard soaked with salty water (a salt battery) can be leaky and difficult to manage, and thus we will use slices of fresh potatoes as a weakly acidic conductor (acid battery), which maintains moisture quite well and does not drip. 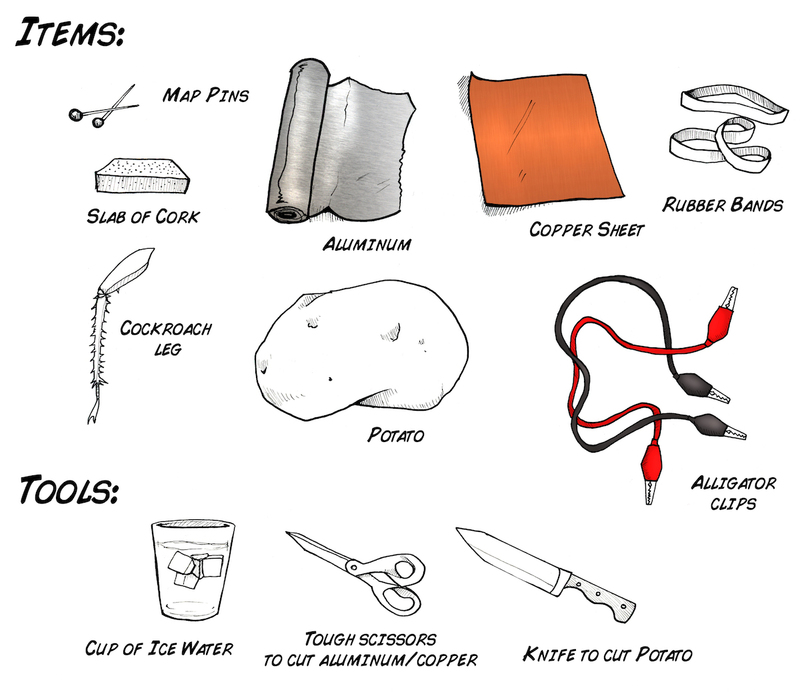 Aluminum, potatoes, electricity... what? Yes, placing a slice of fresh potato between a plate of copper and a plate of aluminum will enable electron flow that we can harvest. Aluminum, being the anode, loses electrons (oxidation). The electrons flow through the acidic bridge (the potato) to the surface of the copper plate, which, being the cathode, gains electrons (reduction ). What is the potato doing? By being electrically conductive and slightly acidic, it permits electron transfer from the aluminum to the copper via the H+ ions (the hydrogen ions are reduced to hydrogen gas H2). The voltage that this homemade battery generates is not very high (0.5 volts), and the current is very low (~1 mA - our lab voltmeters are not even sensitive enough to reliably measure it) but the battery is sufficient to stimulate a cockroach leg or turn on an LED if multiple copper-potato-aluminum cells are "piled" up. But let us consider the historical context. What motivated Galvani to even examine the electrical excitability of nerves in the first place? What was the knowledge of his time? Systematic study of electricity as "something" was just beginning in the 18th century in Europe. Some clues were eternally present. The ancient Greeks had observed odd properties of substances living and material. For instance, Amber is an excretion of certain trees in response to wounds and was made famous by the movie Jurassic park. When rubbed with a piece of cloth or hair, hardened amber will attract small particles of dust, and indeed the Greek work for amber is "elektron". 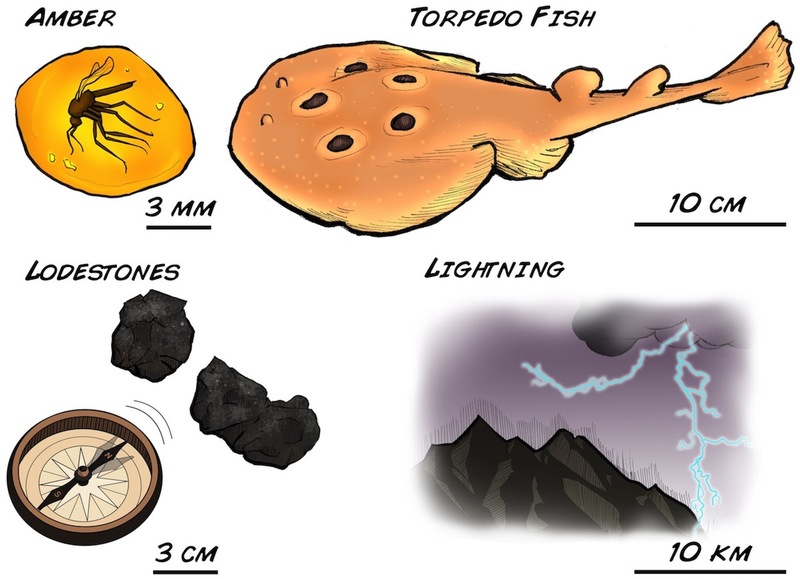 Mediterranean peoples had also long known of the strange properties of the torpedo fish that in lived in coastal areas and caused stinging sensations when bothered (the fish uses electrical shocks for attack and defense behaviors ). But what is happening exactly when the torpedo fish "shocks" someone? And how is amber able to attract dust? Are the two phenomena even related? And do they have anything to do with the lightning of electrical storms? For that matter, what is even going on in lodestones (naturally occurring magnets). Such questions were very of the age in 18th century Europe. The Leyden Jar (the first capacitor) had been invented in the 1740's, and reliable electrostatic friction machines (machines capability of generating electrical sparks) had recently just been invented as well. Interested in the possible connection between electricity and living beings, Bologna physician and professor Luigi Galvani began studying "electrophysiology" in 1780. He was aware of previous experiments by other Italian scientist Tommaso Laghi, who observed in 1757 that electrical stimulation of nerves caused muscle contraction. Using a common frog leg preparation in which the muscle and nerve tissue are viable for a number of hours, Galvani decided to systematically study this phenomenon in more detail, leading to the recognition that we give him today. 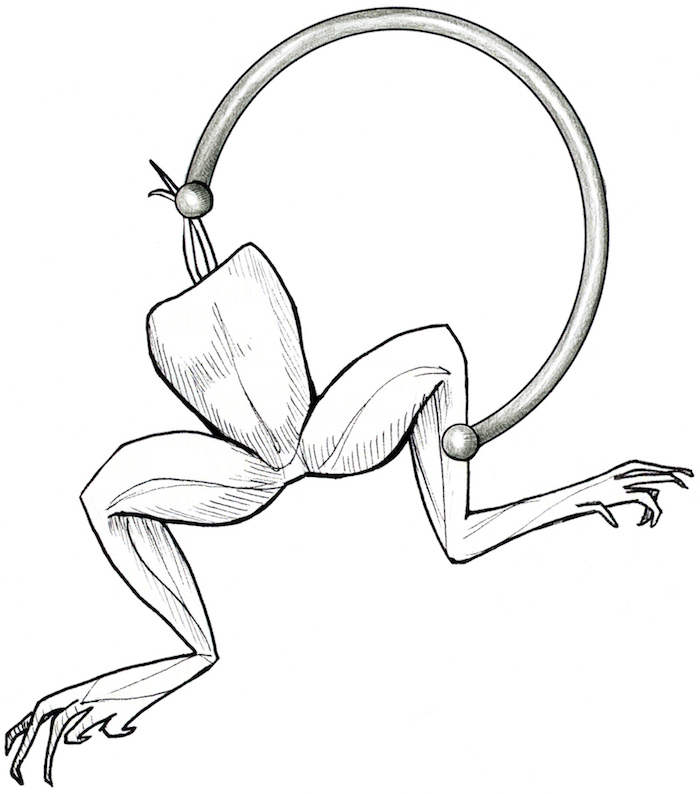 The majority of Luigi's experiments involved connecting the frog legs to capacitors and metallic loops during the 1780's, which are described in detail in his 1791 magnum opus: "De viribus electricitatis in motu musculari commentarius" - translated from Latin to "Commentary on the Force of Electricity on Muscular Motion." Beginning his general experiments on exactly November 6th, 1780 (noted from his lab book), he connected a type of capacitor - a "Franklin Square" (yes, an invention of Benjamin Franklin) to the nerve of a frog leg, causing the leg to famously twitch. Luigi's next step was connecting nerve to muscle, or nerve to nerve, with metallics arcs and examining leg contraction . These experiments revealed that an external voltage source (be it in a spark generator or a capacitor) was not necessary to cause leg contraction, providing evidence to Galvani's hypothesis that the nerve and muscle tissue itself was a generator of electrical energy that it used for its own proper functioning. After Luigi published his results in 1791, he gained a reader turned scientific rival from nearby Pavia. Alessandro Volta had previously invented an instrument called the electrophorus - a capacitor that could be used multiple times without recharging, and the "weak electricity" of the frog nerve experiments intrigued Volta. He began examining the preparation as well, and he importantly found that using using bimetallic arcs of two different metals worked much better in stimulating frog legs than arcs composed of just one metal, and he published this observation in 1792 in "Memoria seconda sull'elettricita animale" (-Italian - Second Memoir on Animal Electricity). He believed that Galvani's use of metallic arcs and organic tissue created a sort of electrical disequilibrium that caused contraction, and the animal did not generate its own electricity. The vigorous debate between Galvani and Volta continued for three years more in another round of letters and manuscripts, but then Napoleon arrived, disrupted Northern Italy, and Luigi died in 1798. Volta continued investigating, going on to build a prototype based on the two metal disequilibrium called "the pile" - which was the invention of what we now call the battery . His prototype contained alternating layers of copper, salt-water impregnated cardboard, and zinc, and when he sent his battery to the Royal Society in England in 1800, Volta gained enormous international recognition. The use of the battery as a continuous controllable source of voltage and current allowed many more experiments by many more scientists, such as Humphrey Davy and Michael Faraday who used the battery for electrolysis experiments that led to the discovery of new elements (sodium, potassium, chlorine, calcium, etc), and Georg Ohm using the battery to derive the law after his namesake. 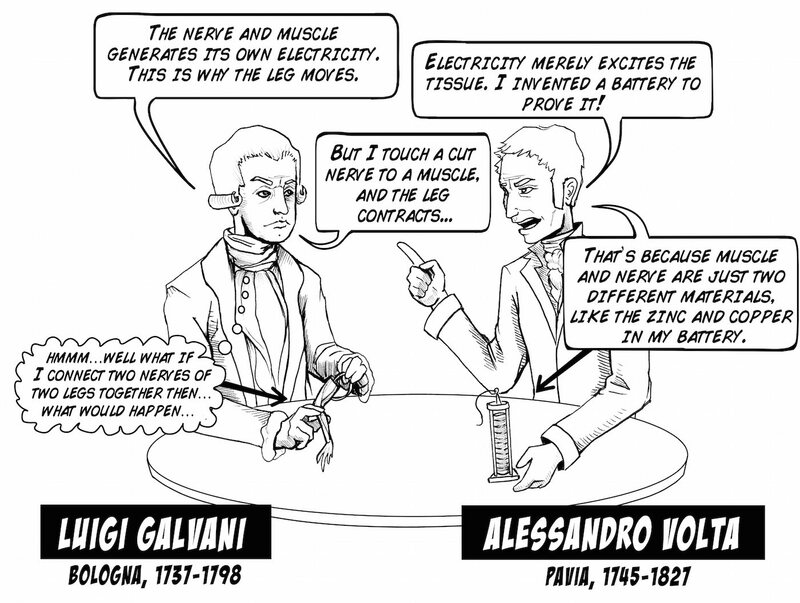 This excellent "Galvani/Volta" debate centers on 1) whether nerve or muscle tissue generates its own electricity or if 2) externally applied electricity merely excites the tissue. The debate was not resolved until the mid-19th century when electrical impulses in nerves were observed through indirect methods with the first primitive amplifiers , and finally unequivocally in the early 20th century with the invention of the vacuum tube amplifier. But, being residents of the future, we can now see that both Italian scientists were correct. 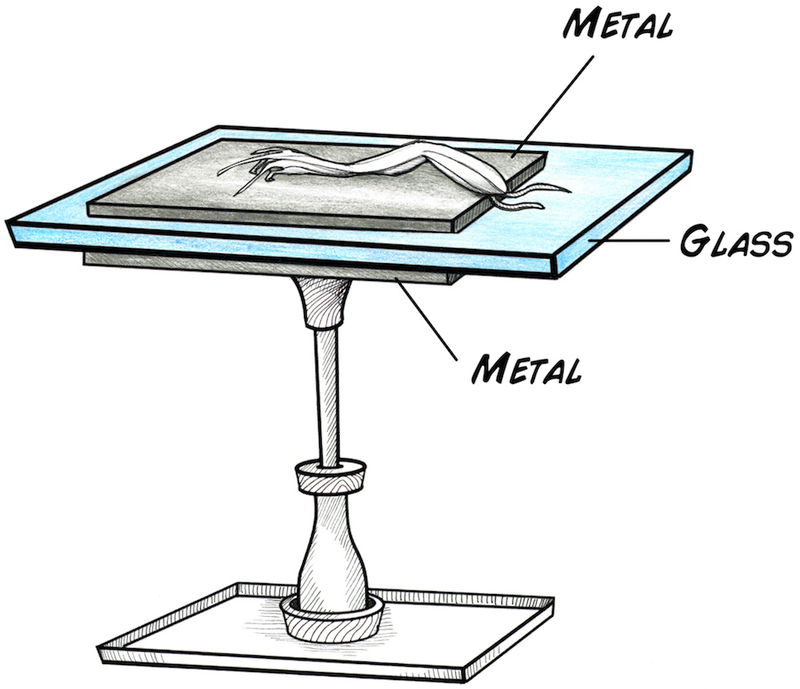 Volta's suggestion that two metals connected with a salty medium (the frog) could generate electricity was correct. Galvani's suggestion that the nerves and muscle generated their own internal electricity for proper functioning was also correct. Which would you think if you were present in that epoch? Let's see. Here are the tools with which you will begin the fields of neuroscience and electronics. We need about 2-2.5V Volts to do our experiment, so we will build a "pile" of 5 cells. ...which we can use to stimulate a cockroach leg or turn on an LED. Cut five 1.5 inch x 1.5 inch (4 cm * 4 cm) squares of copper sheet. Cut five 1.5 inch x 1.5 inch (4 cm * 4 cm) squares of aluminum or zinc. Cut five 1.5 inch x 1.5 inch (4 cm * 4 cm) slabs of potatoes. Keep at 1/8 inch or 0.3 cm thick. 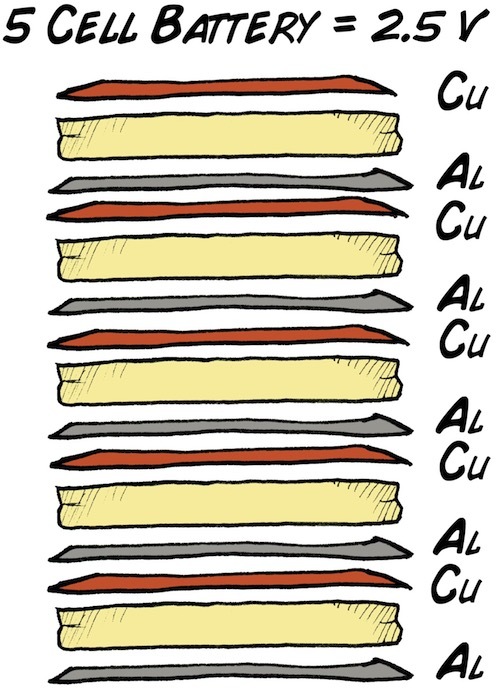 Make a sandwich of one square of copper, one square of potato slice, and one square of aluminum . If you have a voltmeter, place the positive lead on the copper piece, the negative lead of the aluminum piece, and measure the voltage. You should measure ~0.5 Volts. We need at least 2-2.5 Volts to stimulate a cockroach leg or light up an LED, so we will stack up 5 copper/potato/aluminum cells. This is an "artisanal battery," thus subtle adjustments like making sure the copper and aluminum layers are not touching, that the potato slices have good contact with the metal, etc, will ensure you have the appropriate voltage. Secure the five cells with rubber bands to make sure all layers are touching their adjacent layers snugly, but not be so tight that the metal sheets deform, touching each other, and short-circuit (this will only reduce the voltage -- the battery is too weak to be dangerous when short circuited). Using a red alligator cable as the positive lead, connect one end of the red alligator clip to the copper on one end of your pile and other end to the longer leg of a red LED. Connect a black alligator clip to the aluminum on the other end of the pile, and, looking at the LED head on (it helps if the room is dark), tap the shorter leg of the LED with the other end of the black alligator clip. If your artisanal battery is well constructed, you should see the LED briefly flash on and off with a low intensity light. You know your battery works! Now it is time to excite the cockroach leg. Take a juvenile cockroach and submerge it in a jar of ice water, and wait 1-2 minutes as the cockroach enters anesthesia. Once the cockroach has stopped moving, remove it from the ice water, grasp the femur with your fingers, and in a smart, swift motion, pull the leg off. 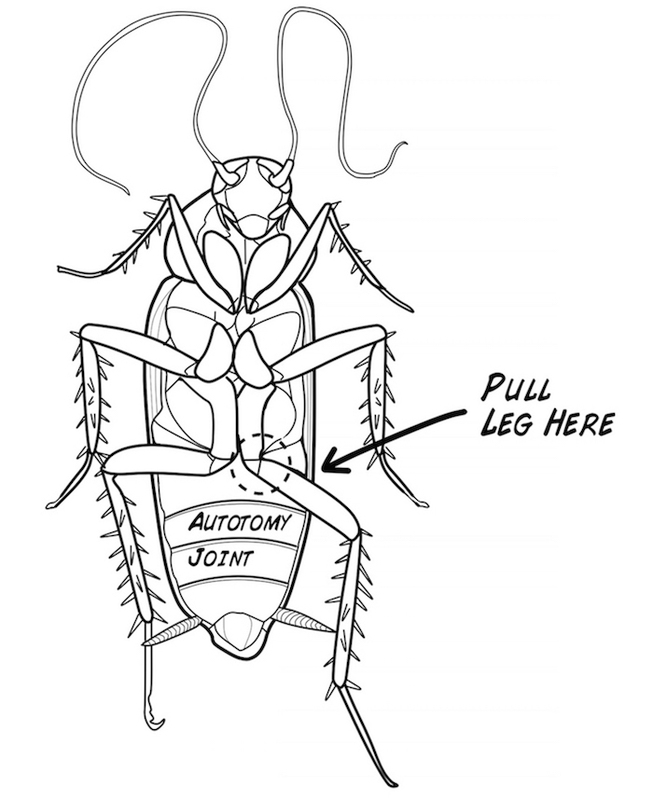 A quick movement will cause the minimum damage to the cockroach, as the leg will break cleanly at its built-in breakage (autotomy) joint, thus assuring fast healing and regrowth of a new leg. Return the cockroach to its home cage. It will recover in approximately half an hour and be fine. Place the leg of the cockroach on a piece of cork, and place two pins in the femur of the leg. Attach the red alligator clip to one map pin (which is which does not matter). Then, briefly tap the other map pin with the black alligator clip. The tarsus (tip, clawlike part of the leg), should twitch with each tap. Congratulations, you have just begun electronics and neuroscience! We emphasize again, as you do this experiment, imagine that as of yet 1) there is not any unifying theory of how electricity works, and 2) physiology is still in its infancy . What would you think was occurring if you connected a primitive battery to a nerve of muscle, saw twitching, and had no background knowledge? 1. It was later discovered that a torpedo fish can deliver up to 200 V electric shocks due to highly modified parallel arranged muscle tissue contained inside its head. 2. Galvani also performed a wireless variant that would be bizarre even if replicated today (stay tuned). 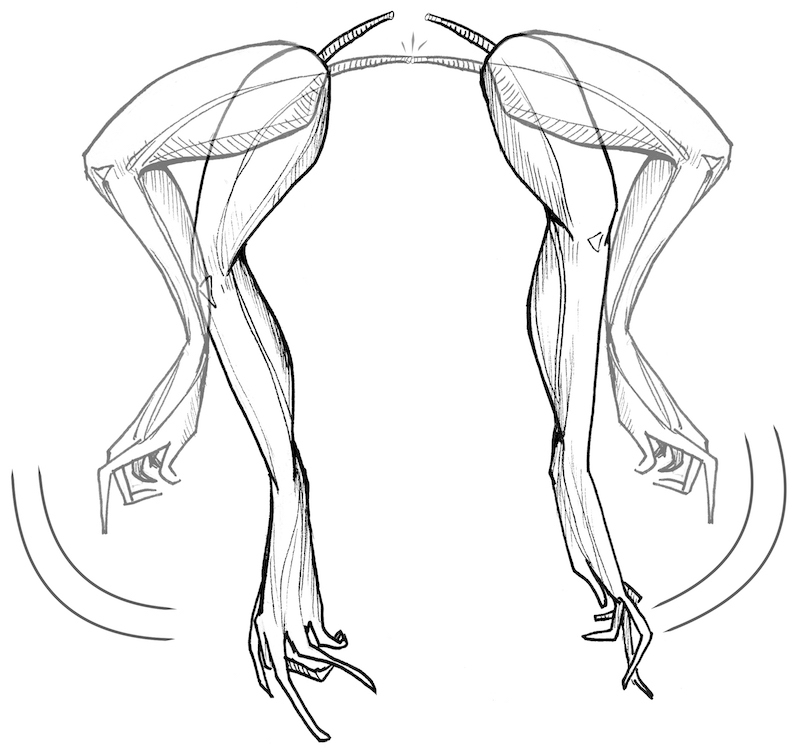 When an electrostatic machine was generating electrical sparks, while at the same time, in the same room Luigi Galvani touched a frog nerve with a metallic scalpel (unconnected to the machine), the leg muscles would contract as well! At the time there was no theory to explain this effect, as this was a full 100 years before Heinrich Hertz's experiments showing that a high voltage spark generated electromagnetic waves that could induce another spark in an isolated adjacent coil, beginning the wireless telegraphy age. 3. This can seem confusing, but it was later found in the 19th century that cut nerve has a damage current called a "demarcation current" that can sometimes be sufficient to excite other nerves and muscle if the preparation is very fresh. 4. Oddly enough, inspired by the torpedo fish, due to, again, the specialized shocking muscles cells arranged in parallel columns. 5. See our treatment on the development of amplification for much more details on the history of amplifier invention. 6. In this cell, the copper is the anode and is the positive side. 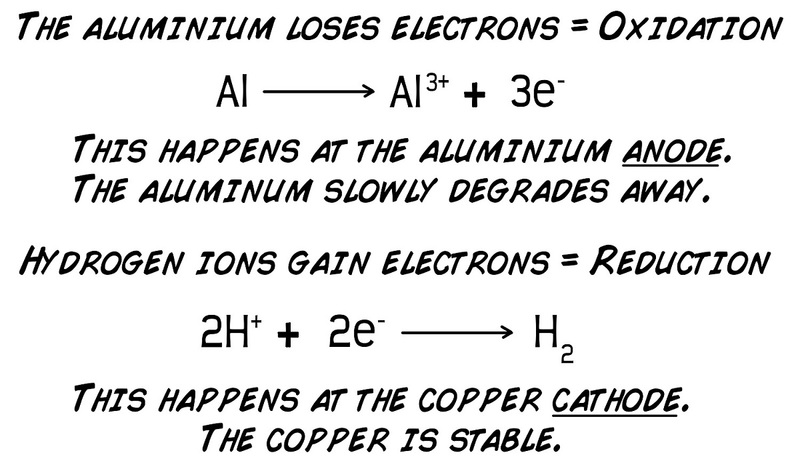 The copper is the "positive" side as it receives electrons from aluminum. This terminology is famously designed to be confusing. The aluminum is the anode as electrodes flow out of it, buuuttttttttt...due to historical reasons current is opposite the direction of electron flow, thus current flows "into the anode," though electrons flow "out of it." 7. We thank the students and teachers of Colegio Alberto Blest Gana for inspiring us to create this lesson as part of an "Introduction to Neural Engineering" high school course. Lo llamamos "el experimento de la papa-pila-pata"
If you use zinc instead of aluminum, each cell will generate 0.9-1.0 V instead of 0.5 V. Why does changing the anode metal to zinc increase the voltage? You can use this experiment to derive Ohm's law. 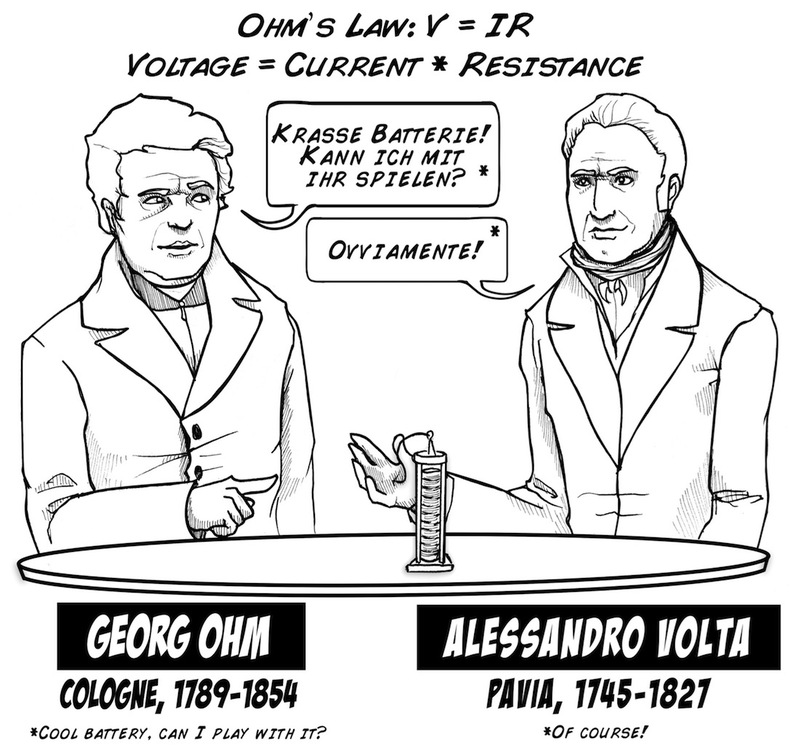 Georg Ohm used Volta's battery and noticed when he added more cells to the battery, the brightness of the a lamp ("current") became larger. You can use a salt bridge (like Volta did with salty water cardboard) in place of an acid bridge (like we did with the potato). 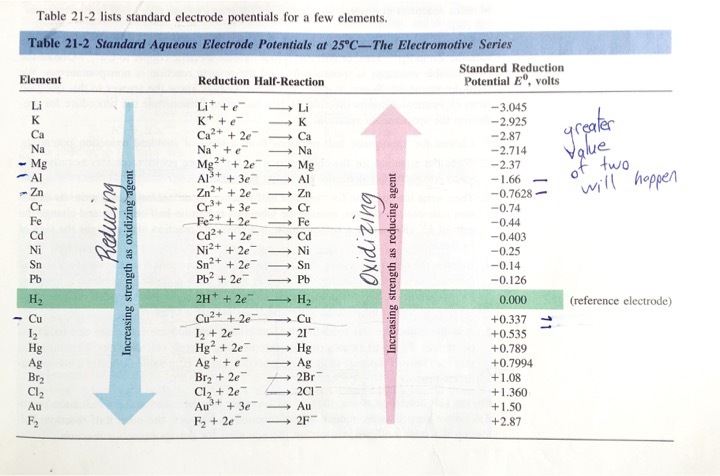 The electrochemistry is slightly different - see references below. Try fruits and vegetables of different acidity to see if that affects the power of your battery (sour apples vs normal apples, for example). Shocking Frogs by Marco Piccolino and Marco Bresadola - A dense work, translated from Italian, in which the authors carefully analyzed Galvani's and Volta's lab books and correspondence. This is deep as you can go without learning Italian and Latin, traveling to Italy, and reading the lab books of Volta and Galvani yourself. Almost of the detailed historical information, Galvani quotes, etc, in this experiment writeup comes from the Shocking Frogs book, and we thank the authors for their scholarship. Galvani's Spark by Alan McComas - A very useful read on the history of electrophysiology that we recommend to everyone. Salty Science by Chasteen, Chasteen, and Doherty, offers further reading on the actual electrochemistry reactions of the copper aluminum batteries in their "salt" or "acid" variants. Observations on Lemon Cells by Jerry Goodisman offers an electrochemical explanation on the famous lemon variant of the copper-zinc battery.